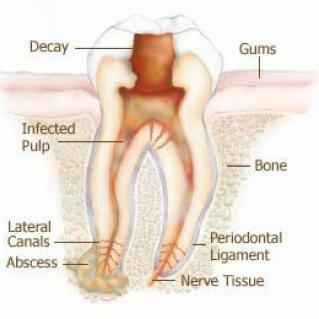 When a tooth has an infection a root canal treatment may be the only solution to enable the tooth to be retained. The root canals are cleaned and disinfected. This is usually performed over several appointments. X-rays are taken during this procedure to determine the number, shape and precise length of canals. It is very important that all the infection is completely removed before the final stage of sealing. The canals are sealed so that they will not become re-infected again. A porcelain crown would be the final restoration usually once the tooth has been given time to settle – six months or so later.